We were thrilled to host our latest Swindon Stories book-gifting initiative last week. Working alongside Swindon Borough Council and WHSmith, we ran a pop up story shop at The Brunel Shopping Centre to encourage families to share stories and enjoy reading together. An empty shop unit was transformed for the occasion and families enjoyed storytelling sessions with local performer Cassandra Wyeand book-themed craft activities. Representatives from the National Literacy Trust handed out hundreds of books for children of all ages, which were generously donated by campaign partner WHSmith. “Sharing stories for just 10 minutes every day is enough to make a difference to a child’s literacy skills. 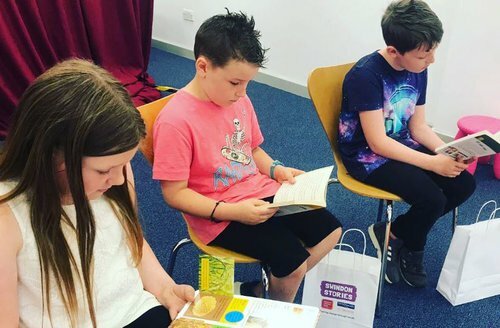 The school holidays are a fantastic time to get into the habit of reading regularly, so we were delighted to see so many families getting excited about stories at our pop up story shop." Swindon Stories was launched by the National Literacy Trust and Swindon Borough Council in February 2018, supported by WHSmith. The campaign encourages the whole town to make reading, writing and talking a priority, with a range of projects and initiatives to give young people the literacy skills they need to succeed in life. Find out more about Swindon Stories.